Aaron Burr (1756-1836) is remembered today largely because of the 1804 duel in which he fatally wounded Alexander Hamilton. 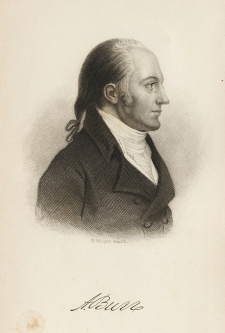 Burr’s connection to Albany began in 1781, when, while studying for the bar, he moved to Albany to petition the New York Supreme Court to waive the required three year legal apprenticeship, because of his military service during the Revolutionary War. While waiting for the Court’s decision, he settled into his life in Albany. In January 1782, Burr’s petition was accepted and he was admitted to the bar. Shortly thereafter he set up a law office in Albany. After his marriage on July 2, 1782, Burr and his wife, Theodosia Prevost (1746-1794), set up house in Albany. Theodosia wrote to her sister encouraging a visit: “Our house is roomy but convenient…The air of Albany healthy.” Their first daughter, Theodosia Bartow Burr was born a year later in Albany. In late 1783, after the war ended, the family moved to New York City. Legal business and political matters found him traveling often to Albany. After serving his first term in the New York State Assembly and then as Attorney General of New York State, Burr defeated incumbent Philip Schuyler (Alexander Hamilton’s father-in-law) for a seat in the United States Senate in 1791. Ten years later, Burr’s daughter married Joseph Alston of South Carolina in Albany’s Dutch Reformed Church. This small exhibition is drawn entirely from the museum’s manuscript and political broadside collection and is on view in the atrium.